Chronic hepatitis B virus (HBV) can progress to cirrhosis and hepatocellular carcinoma (HCC). A study published in The Journal of Molecular Diagnostics describes a new HBV assay that offers advantages over currently used methods because it has the capability to detect closed circular DNA (cccDNA) in serum, single cells, and preserved tissue samples. This assay can be used to diagnose HCC at an earlier stage to manage treatment more effectively. “The development of HCC is strongly associated with HBV. Recently, several new antiviral strategies targeting cccDNA have been established to improve HBV clearance. It is of great clinical significance to provide an accurate and sensitive approach for cccDNA detection. With this method, more and more patients with chronic HBV will have precision treatment available to prevent or delay HCC occurrence, and HCC in patients could be diagnosed at an earlier stage,” explained lead investigator Song-Mei Liu, MD, PhD, of the Center for Gene Diagnosis, Zhongnan Hospital of Wuhan University, Wuhan, China. The new assay utilizes droplet digital PCR (ddPCR), which is highly sensitive and accurate for detecting trace molecules such as viruses. By combining ddPCR with PCR, the researchers were able to detect cccDNA in serum, single cells, and formalin-fixed, paraffin-embedded tumor issues. Southern blotting, currently considered the gold standard for this purpose, and other assays have important limitations like less sensitivity than ddPCR in detecting low copy numbers of cccDNA. Other methods require obtaining liver tissue through liver biopsy. “Compared to liver biopsy, serum can be obtained noninvasively, is widely used for clinical diagnostic purposes, and has a homogenous cccDNA distribution. The assay also improves the limit of detection of cccDNA,” noted Dr. Liu. Hepatitis B virus (HBV) closed circular DNA (cccDNA) detection is of major clinical significance. HBV entry into the nucleus of liver cells (hepatocytes) stimulates cccDNA to create HBV RNAs that give rise to virus offspring. Measurement of cccDNA levels can help clinicians determine the level of HBV infection. ddPCR was useful to identify which patients might be harboring hepatocellular carcinoma. Researchers found that almost 90 percent of 68 HCC patients were cccDNA-positive compared to 53 percent of 79 non-HCC patients. Serum cccDNA copy number was found to be higher in HCC patients compared to non-HCC patients. Combined analysis of serum cccDNA and HBV-DNA distinguished HCC patients from non-HCC patients. “This implicates cccDNA as a risk factor for HCC,” said Dr. Liu. The investigators were also able to confirm that serum cccDNA was positively correlated with levels of cccDNA measured in liver samples. “Serum cccDNA is indeed a much better and useful diagnostic marker than intrahepatic cccDNA,” said Dr. Liu. Recently, several new antiviral strategies targeting cccDNA have been found to improve HBV clearance. Therefore, providing an accurate and sensitive approach for cccDNA detection is of great clinical significance for earlier diagnosis and HCC prediction, targeted treatment, and evaluating treatment efficacy. 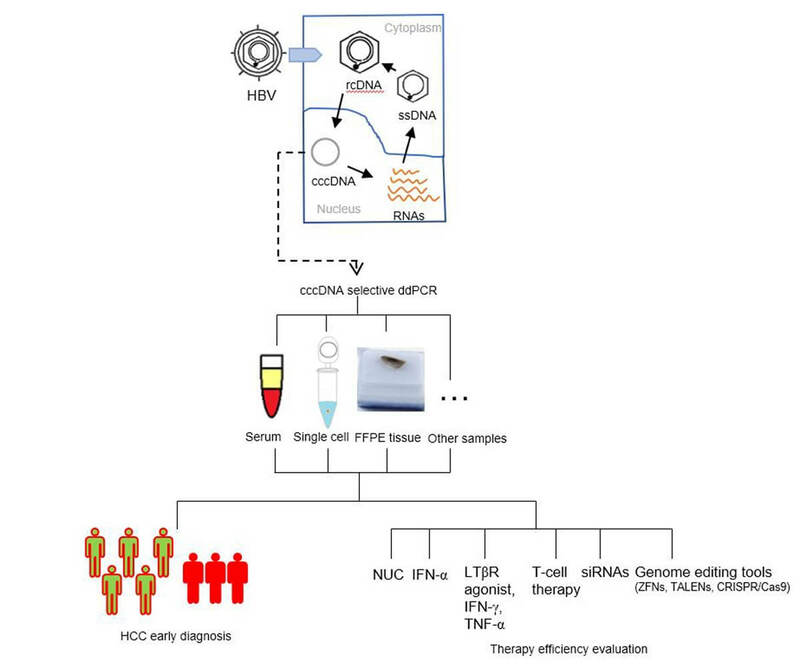 The study is “A Highly Sensitive and Robust Method for Hepatitis B Virus Covalently Closed Circular DNA Detection in Single Cells and Serum,” by Jing-Tao Huang, Ying Yang, Yi-Min Hu, Xing-Hui Liu, Mei-Yan Liao, Roy Morgan, Er-Feng Yuan, Xia Li, and Song-Mei Liu ( https://doi.org/10.1016/j.jmoldx.2018.01.010 ). The editorial is “Commentary: HBV cccDNA—Selective Droplet Digital PCR: A Sensitive and Noninvasive Method for HCC Diagnosis?” by Fan Shen, Consolato Sergi, and Hui-lung Sun (https://doi.org/10.1016/j.jmoldx.2018.03.001). They will appear in The Journal of Molecular Diagnostics, volume 20, issue 3 (May 2018) published by Elsevier. Full text of this study is available to credentialed journalists upon request; contact Eileen Leahy at +1 732 238 3628 or jmdmedia@elsevier.com. Journalists wishing to interview the study authors should contact Dr. Song-Mei Liu at +86 13971452926 or smliu@whu.edu.cn. Dr. Hui-lung Sun may be reached for comment at huilung@uchicago.edu. The study was supported by grants from the National Natural Science Foundation of China (81772276, 81472023) and the National Basic Research Program of China (973 Program) (2012CB720600, 2012CB720605).